Named after the summer home of John Wickson (built in 1860 at the corner of Eglinton Ave. W and Old Forest Hill Road), Forest Hill was incorporated as a village in 1923, and then later annexed by the City of Toronto in 1967. A mixture of stately homes and gardens, as well as apartment buildings and condos, it is one of the three wealthiest neighbourhoods in Toronto. 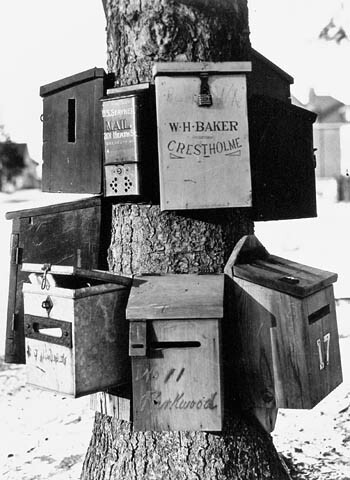 1908 Rural mail boxes on a tree - Parkwood Ave. and St. Clair Ave.
1934 Bridge over Bathurst St. on Old Forest Hill Rd. 1935 Looking north-easterly up Bathurst St. from top of new concrete bridge on Old Forest Hill Rd. 1935 Aerial view north of Lonsdale Rd. and west of Dunvegan Rd. 68 years ago - 1951 - Forest Hill at 1700 Bathurst Street n.w. corner at Warwick Ave.
64 years ago - 1955 - Forest Hill at 1700 Bathurst Street n.w. corner at Warwick Ave.
1955 G.T.R. Belt Line, looking e. across Bathurst St., betw. Shallmar Blvd. & Roselawn Ave.
31 years ago - Friday, December 2, 1988 - Forest Hill at 1700 Bathurst Street n.w. corner at Warwick Ave.